Thanks to two straight stellar games, the MLB The Show series has cemented itself as the best baseball simulation available by far. 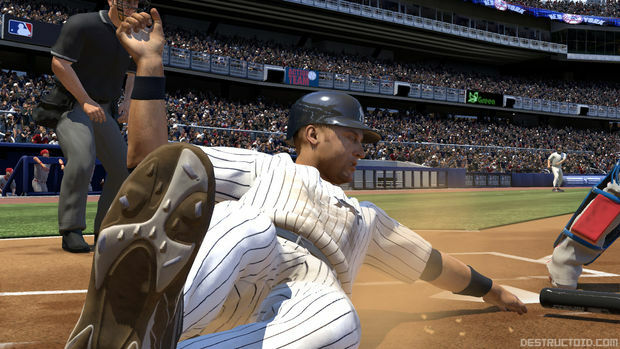 MLB 09 The Show managed to sell 305,000 copies in March 2009 on the PS3, coming in at #6 on the month’s NPD list, even though the game wasn’t available on any other platform. That’s the surest sign of all that developer Sony San Diego is doing something right, and the studio hopes to continue that success with MLB 10 The Show, due out next March. Sony showed the game to the press for the first time at an event in New York City last week. I played a game in the beautifully rendered new Yankee Stadium against Eric Levine, Product PR Manager at Sony, who chose the Philadelphia Phillies. Hit the jump for the skinny on what’s new in MLB 10 The Show, as well as the problems from years past that it addresses -- including one of my biggest pet peeves. The first thing I saw was the Home Run Derby, which is available this year as part of the greatly expanded All-Star Break. You can play a Derby by itself, but it’ll also show up during the Franchise or Season modes before the All-Star Game itself. New to the MLB The Show series is the All-Star Futures Game, an exhibition game between minor league prospects from America and the rest of the world; it will take place just before the Home Run Derby. If you’re taking part in a Home Run Derby contest outside of a season, you can choose from legendary players (like Babe Ruth and Lou Gehrig) and historic stadiums (such as Shibe Park and the Polo Grounds). The game will offer a total of eleven new ballparks, including five new minor league fields. After I sent a few balls into Yankee Stadium’s short porch with Ryan Howard, Levine and I started up an exhibition game. He chose to play during the day in order to show off MLB 10’s daytime transitional lighting system. This year’s game had a dusk-to-darkness shift, but now, you’ll see the late afternoon shadows growing long and the sun getting lower in the sky -- in real time. It’s a subtle but impressive effect that’ll likely take you by surprise the first time you notice it. Weather effects are new to the series, too; our game was played in bright sunshine, but Levine told me that fog will envelop some games. 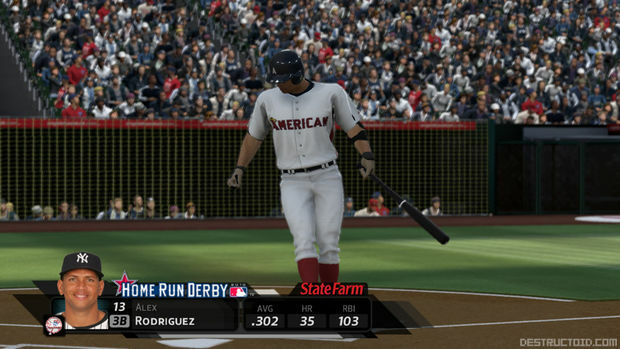 And as you can see in the shot of Alex Rodriguez below, Sony has also given the game’s statistical overlays a face-lift, forgoing blue for black in the color scheme. I’ve been an unabashed fan of The Show for some time now, but one gripe I’ve had with the games is their utter lack of collision detection on the field. At times, you could fool yourself into thinking you were watching a game on TV -- at least until a baserunner literally slid through the guy covering second. It was a jarring thing to see, and it completely ruined the immersive atmosphere that the developers had clearly worked so hard to create. But Levine told me that this was high on Sony San Diego’s list of fixes to implement in MLB 10, and he assured me that players won’t ghost through each other anymore. That was heartening -- the absence of collision detection was the only major visual issue I had with MLB 09. 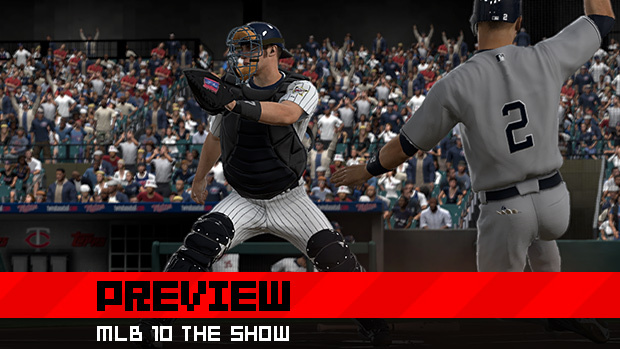 Since Road to the Show -- The Show’s RPG-like single-player mode -- was pretty much the only thing I played in MLB 09, I was eager to hear about how it’s being improved for next year. Joining MLB 09’s hitting and baserunning practice modes will be pitching and fielding drills. 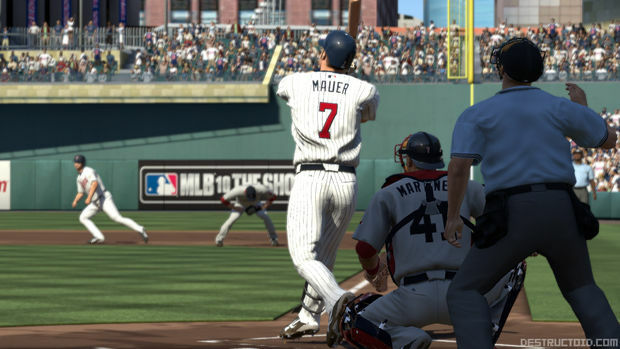 A major addition to RTTS is Catcher Mode. As a catcher, you’ll play a vital role this time: you’ll actually be calling the pitches! This seems like it’ll make playing as a catcher just as rewarding, and fun, as playing as a pitcher. In MLB 09, you could record a video from the instant replay function and save it as an MP4 file on your PS3’s hard drive. That has been expanded into a feature called Movie Maker, which will allow you to edit together up to ten replays -- with all kinds of different camera angles -- in a highlight reel that you can then save to your PS3 or upload to the Internet. It’s not clear at this juncture whether you’ll be able to upload the videos directly to the Web through the game, like you can in certain EA Sports titles, but either way, I’m excited to try my hand at creating a video. My game with Levine was a tense affair; we could each muster only a run through eight innings, and I ended up winning 2-1 on a walk-off single. Nothing has changed in the pitcher/batter interface or fundamental gameplay, and I shouldn’t have to stress that that’s fine -- The Show is so good already that messing with important mechanics like the pitch meter has the potential to screw things up. I did catch some noticeable bugs, but Levine explained that the build we were playing wasn’t very far along in development. And anyway, the kind of stuff I saw -- catchers not picking up dropped balls right away, pickoff throws not being allowed all the time -- will surely be eradicated by the time MLB 10 ships in March. Man, the winter months between now and then are going to be interminable!